One of the most common phonological processes disorders is Velar Fronting. 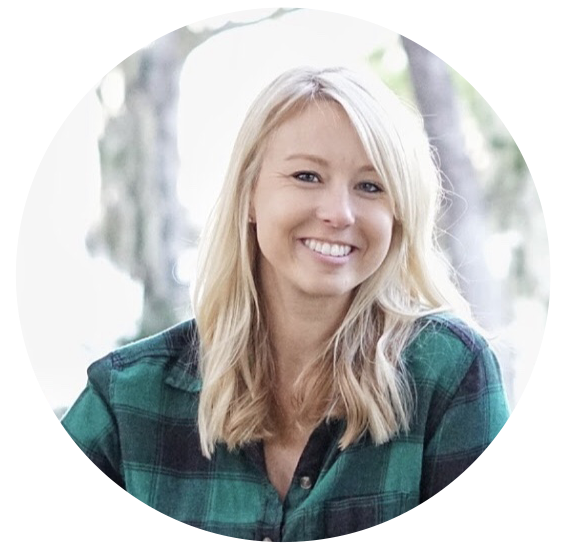 For those readers that are not SLP's (and those of us that are and could use a refresher!) fronting is just like it sounds: the process of producing sounds that should be produced in the back of the mouth in the front... makes sense, right? For example, a child may produce the word cup as "tup" or gate as "date." One trick that I like love using with my students is having them lay on the floor while we practice these targets. I created a 22 page activity that targets velar fronting. 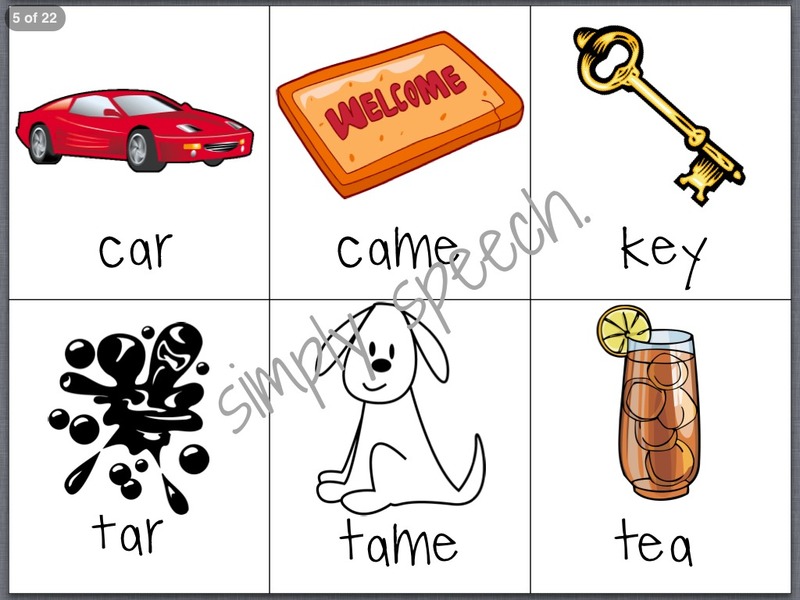 It is made up of minimal pair targets so the child can visually see and hear the difference in the two words. 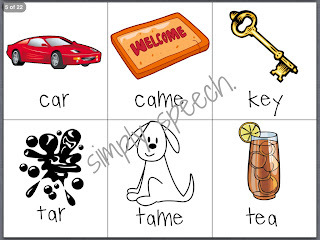 If the child requests tea but says key, you can show them the difference using the minimal pair. 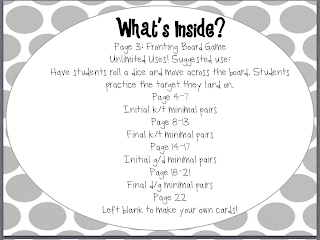 To use this activity, print out the cards on card stock , cut, and laminate. 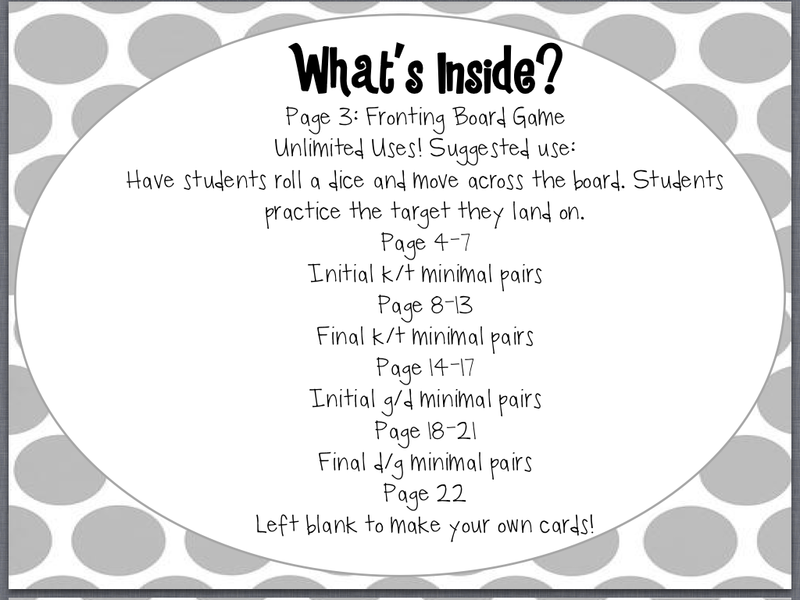 You can use them as flashcards or use the game board and have the students practice the target(s) before they take a turn in the game. 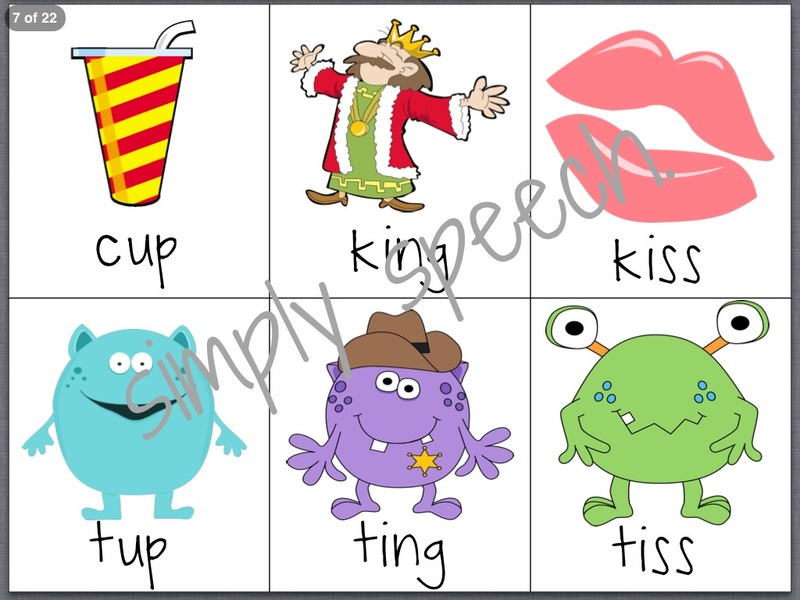 Using minimal pairs is very helpful for the child to really understand the difference in what they are saying and what they mean. Most students don't realize that they are saying the word wrong. This is when pulling out your iPad and recording their productions is helpful. 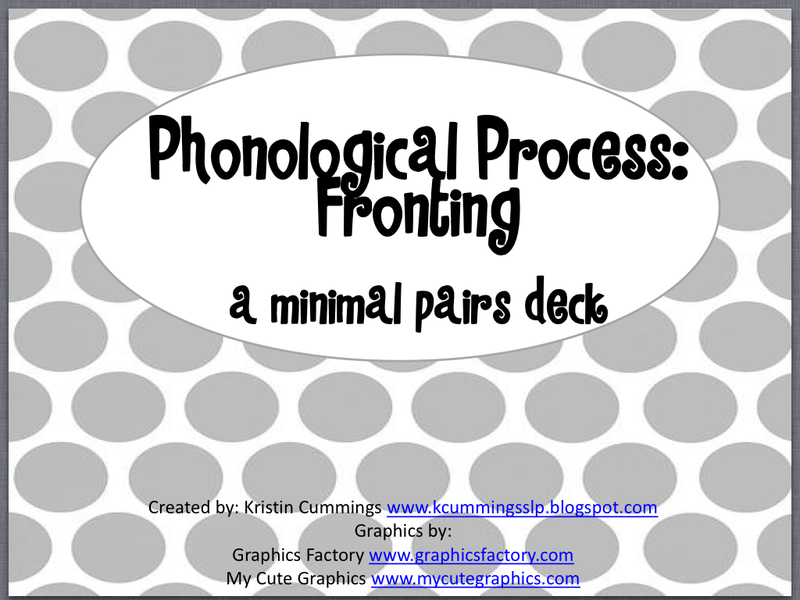 You can download a copy of Fronting: A Minimal Pairs Pack for $2.50 here or try to win a copy below! My caseload is predominantly preschool/early elementary. This activity would be perfect to use with many of these children who exhibit velar fronting! I like to use a large exercise ball with my clients to work on positioning for /k/ and /g/, but on occasion, use the floor as well! I am always running out of materials for discrimination and production. I'm always looking for different materials for fronting. Thanks! 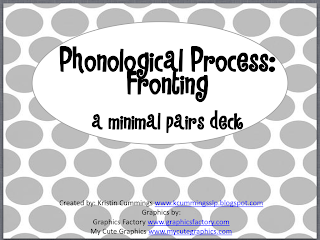 I need these for several of my kiddos whether they need phonological processes or artic errors! I am so excited to hear more from you this week. Phonological processes are something I struggle with. 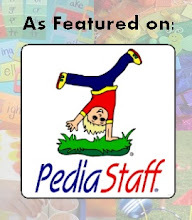 This would be a nice change to my regular ol' cards I use for my preschoolers/kinder kids! For my little punkins who are tired of my fronting materials! Lol, these are super cute and I NEED them! I have one fronting kiddo these would be great for! I would use this with my preschool and K students who still exhibit fronting. 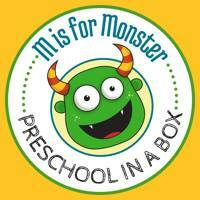 This would be great for my preschoolers! Always looking for new visuals/activities because of so many working on this! I have a number of students that are working on fronting! 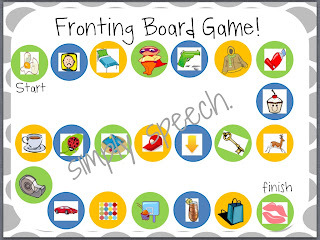 This activity would be perfect to use with my kiddos who exhibit fronting! would love to use it with my PP guys and language group for describing. Super cute materials to address fronting. Looks like such fun! i can always use new materials to change up the materials i already use. These cards are great. 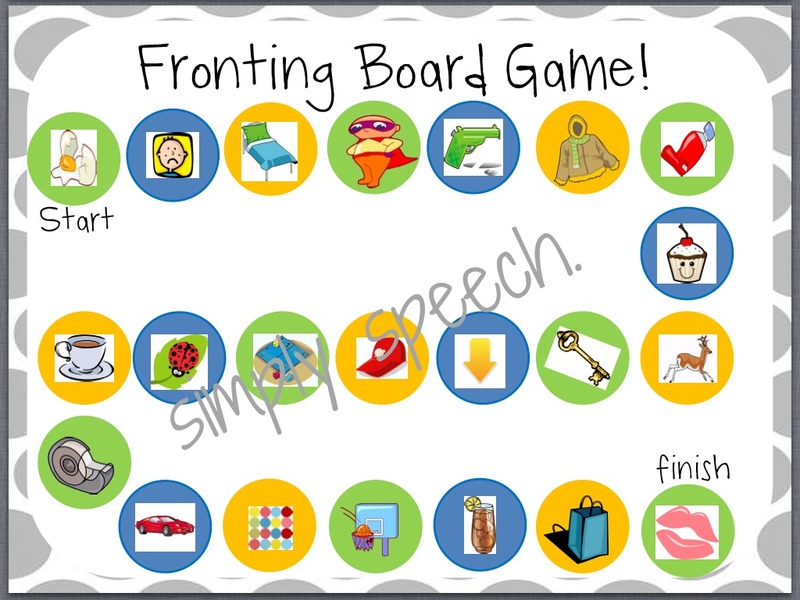 In 29 years as an SLP, fronting is definitely the most common phonological process I have seen. New materials to address this issue are always welcome!!! I would use this with several of my preschool and kindergarten students. They would love this! I would love to use this for a sweet girl who needs a lot of help. This will make it fun for her. I bought this yesterday as I was desperate with a darling kiddie who just could not get these sounds! She totally loved the big bright pictures and produced all her words beautifully- thank you from South Africa! How To Pass Your Evaluation With Flying Colors! When Life Hands You Pronouns... Make Lemonade! A Fun, Easy (and cheap) Way to Target /k/! I Dare You To Check Out This New App! Country Mouse Meets the City Mouse!